Quite an uneventful crossing. The food is not the best and some of you may be asking why I didn’t get the Superfast ferry instead, well it doesn’t sail on a Monday that’s why. 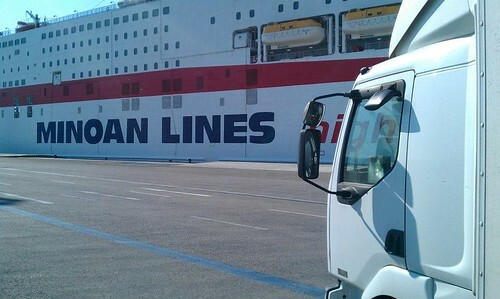 We dock in the new port at Patras just up the road from the old one. I had time to kill as there wasn’t a ferry that day so there was no rush to drive to Pireaus, so I went in the terminal used the free wifi and then got on my way.The immigrants were out in force looking at new ways to get in and on to vehicles for their free taxi to pastures new and benefits a plenty! They are still building the motorway from Patras to connect with Athens and if anyone has driven in Greece they know that even a single carriageway has 2 lanes on it as you drive on the hard shoulder. I pull into gate E1 at Pireaus docks as it is the gate I need and is the easiest to get in too. My ferry is in but it’s not sailing for another 20 hrs so round to gate E3 weigh off and park up where I can. A quick walk to the cafe, kebab n chips, a couple of bottles of beer to take away and into the cab as its blowing a gale and starting to snow. From where I’m parked I watch the unorganised mayhem of the Crete boats loading then slipping away into the darkness of the night. Why is it when you don’t have to get up that you can’t lie in or in my case wake up early and can’t get back to sleep? I have a wander about take some pics of old Volvos, Scania’s and anything else that was worth taking. My phone rings it’s our other driver Paul he’s in a sprinter van and catching me up as we are both heading for the same Island. Paul had another 6 removals on, all small deliveries for the regulars we deal with. As you do, first thing is a brew then book in as we were both booked in on the same number. Tickets acquired we joined the mayhem of loading. If this was the UK health and safety would have a field day, how no one gets run over is amazing. Cabins on our own, showered, then some food. 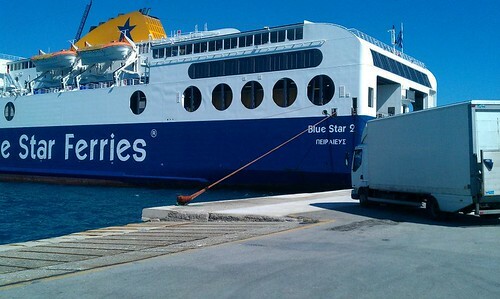 Blue Star Ferries are part of the same company that own Superfast but the food on these ferries are run by Goodies which is a fast food outlet in Greece. Saying that the food is cooked warm and plenty of it. We arrive late but considering that the boat had 3 other stops and struggled getting on the docks with the wind they had done well. Ok we better do some work so the truck was being emptied first then parked up until Sunday when we leave, as the collections were in tight spots etc not very accessible even for a 7.5 ton truck. A phone call and an hour later we are outside the new home, which wasn’t (as usual) finished. 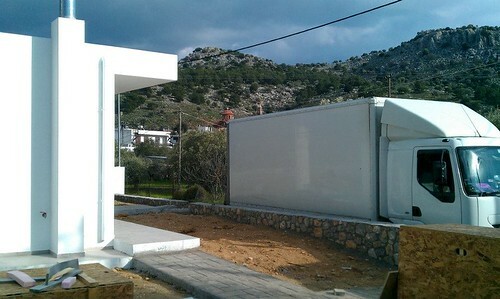 The Greeks don’t seem to comprehend time and completion dates. Any way we could still unload and with extra hands we were done in 2 hrs then a brew and some sarni’s we said our good buys and onto the next job. Luckily all the drops were pretty local to where we were based at Lindos 3. We’re in Lindos itself and if anyone has holidayed there, knows how narrow the streets are so up to the amphitheatre, and take it from there. One drop was in the florists opposite the amphitheatre and another was picked up in a car the last was to a bar on the top road things were going great. 2 more drops in Lardos up the road and the last was where we park the truck at blue line villas. 9pm and we were both empty, shower and bed. It snowed throughout the night and the was still a smattering of flakes on the floor the sun warmed up and it had gone. First job a collection for the truck some people moving back to Whitehaven, it was even tight for the van to get in. 2 hrs and 1 very full 4.3 metre sprinter van later and it’s back to the truck to tranship. 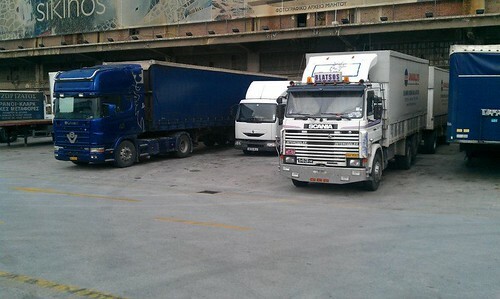 Thats the big one out of the way back to Rhodes town, 8 small boxes. Then Falaraki 18 boxes and Krematsi for another 24 boxes we got back to the truck it was cold dark and blowing a gale so shower Chinese couple of beers and bed. As we had done so well with all the collections and deliveries all we had to do was tranship 2 of the collections on to the truck and that was that done. So nipped round to one of our regulars for a couple of hrs for a brew. Graham the manager of the villas came down and said how do you fancy a night out with us, we said yes please so we all went to Lardos meal and a few jars. 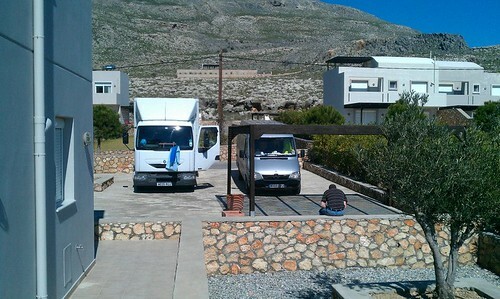 No rush today so up give the truck and van a wash check them both over then say our goodbyes and a hour drive back to Rhodes town to catch the ferry that night. Nowhere is open at the moment so we had a wander around and Paul has an interest in the last wars so a visit to the war memorial and he takes pictures of the headstones. You may think this a little morbid but Paul is helping the Commonwealth War Graves Comission in a program of logging who is buried where. It helps relatives see and find out where they are laid to rest in peace. It took us an hour or so to do the job and if this helps 1 person out then whats a couple of hours in our lives? Back to the port, kettle on, tickets collected, wait to get on the ferry. Paul was only going as far as Kos as his main collection was on the Island. 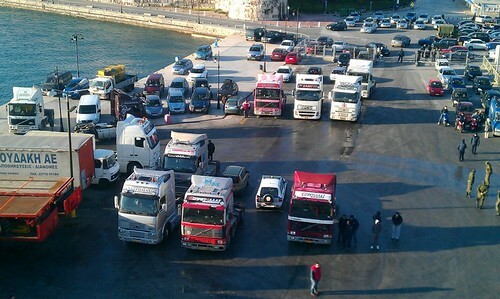 This entry was posted in Drivers Photos, Guest Writers, International Mega Trucking, Renault by truckbloguk. Bookmark the permalink. Things have definitely changed. Today’s drivers have plenty of choices, from basic work trucks designed to haul cargo to option-filled trucks that rival a luxury sedan.